As he did in Robopocalypse, Daniel Wilson masterfully envisions a frightening near-future world. 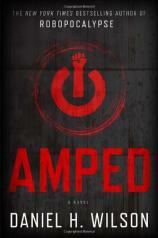 In Amped, people are implanted with a device that makes them capable of superhuman feats. The powerful technology has profound consequences for society, and soon a set of laws is passed that restricts the abilities --- and rights --- of "amplified" humans. On the day that the Supreme Court passes the first of these laws, twenty-nine-year-old Owen Gray joins the ranks of a new persecuted underclass known as "amps." Owen is forced to go on the run, desperate to reach an outpost in Oklahoma where, it is rumored, a group of the most enhanced amps may be about to change the world --- or destroy it.